When did I move from a beautiful sunny inland down with delightfully cooling ocean breezes coming through the mountain gaps every evening. To hot and humid disgustingness! I may as well be living in hurricane alley. 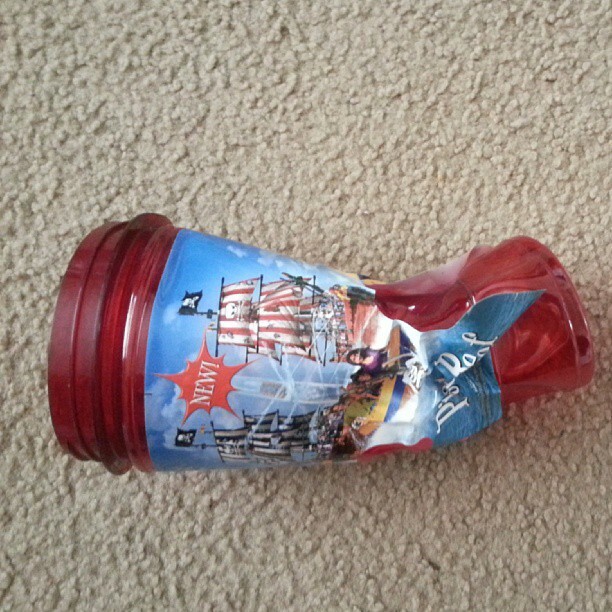 Lest you think I am exaggerating about the weather, here is what happened to a cup my husband left in his car during his travels yesterday. This weather is taking it’s toll on my edible garden and everything seems to be barely holding on. I am nervous about the few fall plants I sowed this week not knowing how long this will last. I don’t want to lose plants like I did in the spring when the wind took out two tomato plants. For the most part the native plants are supposed to be dormant in the heat, hopefully they will bounce back when cooler weather arrives. Oooh, exciting! Pots of dirt. Before long the freesia bulbs should start popping up again. The grape leaves are starting to turn brown. I am going to have to research how to make grapevine wreaths soon so I will have used all three parts of the plant this year. The lonely little pomegranate still hanging in there. But, I got to enjoy the flowers briefly and now I can enjoy the seeds. The bloom spikes on a Muhlenbergia rigens (Deergrass) one of my California natives. Also in bloom this time of year, Zauschneria californica (Hummingbird fuchsia). Hopefully everything will survive this weather and I will have some yummy arugula, lettuce, carrots and beets coming up soon, as well as some tomatoes and eggplants still producing. Very lovely photos. We had a frost last night and I left the towel on my tomatoes tonight too. Still we should have a lovely leaf season if it stays warm during the day and cool at night. I'm just not ready for 37 degrees yet. My tomatoes and peppers and herbs are doing well up here. Still warm. I know I have to start pulling the basil and start making more pesto as it will go to seed soon and I love having it frozen. I LOVE your pics of the sunflower seeds. That is soooo cool.